Wish to reupholster your patio with curtains? Want to redo your old bedroom curtains with hanging rod, or pole? Find the best curtains accessories supplies at Ma Petite Mercerie. Enjoy novelty hooks, wood rings, tie back, clip rings, curtain poles, eyelet tape and more online. Discover our curtain hardware for unique made to measure curtain panels! Purchase today our cheap poles, double curtain rod, and curtain rod hardware. 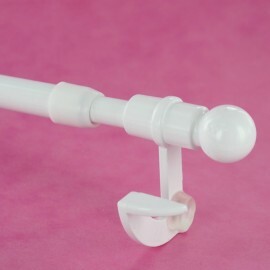 Thanks to its self-locking end brackets, you will enjoy our practical white curtain rods. Furthermore, no need for curtain rod brackets as long as our curtain poles are ready to fit. Stitch a unique pair of curtains and hang it to your window thanks to your window adjustable curtain rod. Plus, you can order the best curtain hook, drapery rod, curtain holdbacks and tiebacks in our curtain accessories section. Make your home come to life! Hang your new home furnishings thanks to our collection of curtain poles, tracks, and rods. Either you want to cover a cabinet, replace your wood pole or install new curtains for your kitchen window, you will find the best supplies for your DIY project. Stitch metal curtain, bay window curtain, blinds, eyelet curtain, sheer curtains, or blackout fabric with our blackout lining fabrics, satin or jacquard fabrics. Lightweight and high quality, you will fell in love with our handy and easy to install curtain rods which will compliment your interior. No need of a screwdriver or other window hardware. Use our hooks or curtain ring, and window rods. Plus, thanks to its standard diameter, our curtain rod will adapt any windows, curtain rings and eyelets. Thus, you can easily choose the eyelet tape or eyelet you want to stitch or sew to your drapery. Finally, add finials to your curtain rod set, cute bronze tie backs, grommet, decorative holdbacks and more.